Coming into Week 4, just nine teams remained undefeated. Boston College was the first to fall, dropping to 9-1 with a five-set loss to crosstown rival Harvard on Thursday to open the New England Challenge. 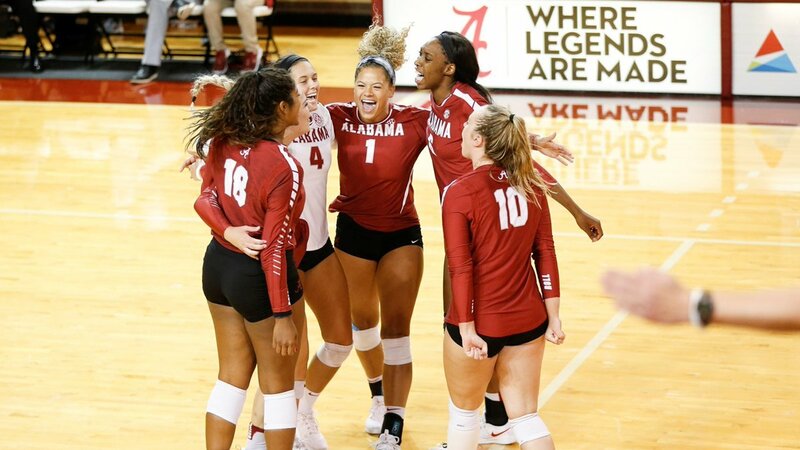 One thing is for sure, however, at least one more of the teams will not make it out of Week 4 unbeaten as Alabama and Purdue face off at the Crimson-White Tournament in Tuscaloosa on Friday night. Here’s a look at the remaining undefeated teams and how they got here. First to Ten: The Crimson Tide extended its win streak to double-digits with a five-set win over Samford on Tuesday. Alabama has played traditional Top 25 teams in Western Kentucky and Missouri State, besting both on opening weekend in Charleston, South Carolina. This Week: The Crimson Tide plays at home for the second straight weekend, playing host to South Alabama (5-5), Southern Miss (6-4) and fellow unbeaten Purdue (9-0) at the Crimson-White Tournament. The marquee matchup happens at 8 p.m. ET Friday when Bama battles the Boilermakers live on SEC Network+. Tough Tests/Big Wins: The Cougars defeated then No. 1 Stanford in five and vote getter Wichita State via sweep at home on Week 2. BYU has played away from home two of the three weeks thus far – besting No. 10 USC 3-0 and No. 25 Marquette in four sets at the Marquette Invitational last weekend and also going 2-0 against Duke in Durham, North Carolina, on opening weekend. This Week: Top ranked BYU continued its unbeaten streak on Thursday with a sweep of No. 25 Utah to move to 9-0. The season-opening nine win streak matches its 2016 start. The Cougars will look to keep that streak alive with another instate matchup on Saturday, facing off against Weber State (4-3) in Ogden, Utah. Traveling: With matches in San Diego, Honolulu and at home in Portland, the Pilots have compiled a 9-0 mark, including five-set wins over Wyoming and Hawaii. The team has yet to face a ranked team, however. This Week: The Pilots fly to Boise, Idaho for the Boise State Classic this weekend to face Sacramento State (5-6), Boise State (6-2) and Cal State Northridge (4-5). Home Sweet Home: The No. 9 Panthers are 6-0 at home during their win streak, including a four-set win over No. 24 Cal Poly on opening weekend and a sweep of No. 12 Washington last week. This Week: Pitt looks to keep its win streak alive when it welcomes College of Charleston (7-4) and High Point (3-6) to Fitzgerald Fieldhouse for the Pitt Invite. How Sweep It Is: The No. 20 Wolverines are the only unbeaten to pick up all of their wins via sweep. After kicking off the season with two win at the War Eagle Invitational in Auburn, Alabama, Michigan has played its last seven matches at home. The team’s toughest test came on Saturday against Colorado State in the finale of the Michigan Challenge. This Week: The Wolverines are set for a home and home series with Notre Dame (6-2), playing at home in the Crisler Center on Friday and in South Bend on Sunday. Friday’s match will air live on the Big Ten Network. Friendly Confines: No. 21 Purdue hits the road for the first time in 2018 this weekend. The Boilermakers had their biggest scare of the eight-match home slate on Saturday, going the distance with regional foe Louisville to conclude the Stacey Clark Classic. Other tests have come from Notre Dame and Xavier, each going four sets. This Week: Purdue heads to Tuscaloosa, Alabama, to face off with South Alabama (5-5), Southern Miss (6-4) and Alabama (10-0) in their first voyage outside of Holloway Gymnasium. Alabama assistant Ryan Freeburg is a former Boilermaker staffer acting as a manager and volunteer assistant coach (2010). Road Warriors: No. 6 Illinois may have the most impressive voyage to 8-0 as all of their contests to date have been played on the road with trips to Fort Collins, Colorado; Seattle, Washington; and Cleveland, Ohio. Along the way, the Illini have face tough foes in Colorado State (3-2), Colorado (3-0) and Washington (3-1). This Week: The Fighting Illini make their first appearance in Huff Hall at 6 p.m. ET Friday when they welcome (RV) Northern Iowa (5-4) as part of the Illini Classic presented by Hyatt Place. Also among the field are No. 14 Creighton (6-3) and Lipscomb (5-4). Coastal Jumpers: The No. 18 Cougars picked up its two marquee wins with back to back four-setters against Northern Iowa in Cedar Falls on Aug. 31 and Sept. 1. Washington State played in Raleigh, North Carolina, on opening weekend before returning home for a trio of matches on Week 3. This Week: The Cougs are the first of the unbeatens to play on Friday with a morning match against Northern Illinois (2-10) to open the Western Kentucky tournament in Bowling Green, Kentucky. WSU also is set to face the host Lady Toppers (6-4) on Friday night and East Tennessee State (9-2) on Saturday.